Over 10 years ago, Jeff Kaufman, a warrior in the battle against Unity and a former ICEUFT member of the UFT Ex Bd along with James Eterno, got out of the business of opposition caucus politics, pointing out there was nothing much to gain in terms of growth. James Eterno and I didn't take the same path and now with the chaos in the opposition in the UFT we see that Jeff was on the right track. We have discussed taking up golf. Since then Jeff has come out to Rockaway to coding teach at the former Far Rockaway HS campus - the school was closed and divided in multiple schools. Jeff has urged me to stop by and check things out and maybe even volunteer - I do have a coding background. So maybe this blog will morph into something else -- coding and golf. Note the theme the kids worked on was social justice oriented. Jeff doesn't get enough credit for the work he has done in that area, especially prison reform. Good luck Jeff and kids in the next level of the hackathon. 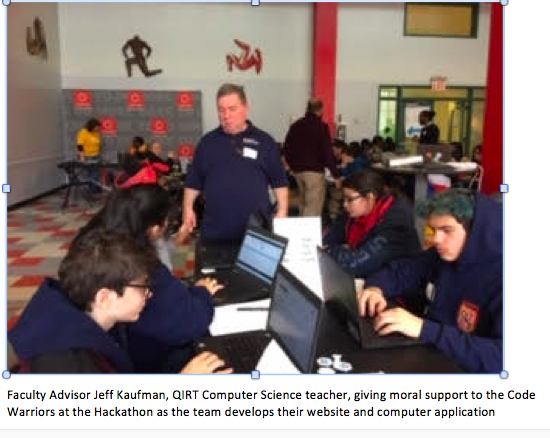 The old adage, “You can’t fight City Hall” might get a new meaning when 5 student programmers from Queens HS for Information, Research and Technology located on the Far Rockaway HS campus, get to demonstrate their coding skills at City Hall after winning the 2nd Annual Queens Regional Hackathon held on February 7th at LaGuardia Community College. The team, the “Code Warriors” will meet the winners of the four other boroughs where they will be judged on their ability to solve social issues through computer programming and the use of Big Data. 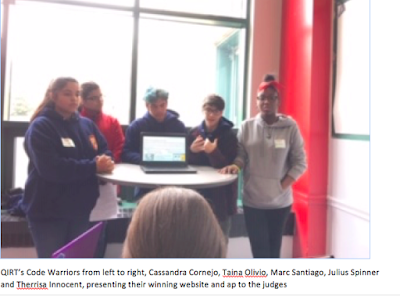 At the LaGuardia event the “Code Warriors” developed a protype for a computer application and website which will help tenants in private and public housing obtain heat and hot water when their building’s boilers break down. The QIRT team also won special recognition for their use of data obtained from 311 heat and hot water complaints in a database maintained by NYC since 2012. The event was co-sponsored by BetaNYC, a non-profit tech firm which supplies training and tech services for New York City’s Community Boards and The NYC Department of Education’s CS4All which is tasked with bringing Computer Science to all New York City public schools in the next 5 years.